Volante Sliding Wardrobe Doors The benefits of sliding door storage systems over standard hinged doors are well known and have been utilised in Europe for many years. Their space saving characteristics, the ease of access they afford, and their sleek contemporary styling makes them a highly practical solution for the homes of today. The Volante sliding door system follows these principles, helping to solve your storage needs. 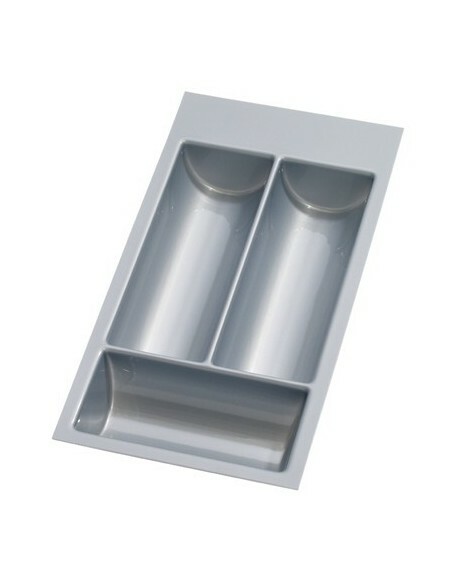 We also appreciate that quality is just as important to our customer's and we can guarantee this with our Volante range being manufactured here in Great Britain to the highest standards, ensuring no compromise to gaining the look desired. The following feature a selection of inspirational room sets to provide you with ideas and suggestions of just what is possible with the Volante sliding door system – choose from 6 standard panel configurations, over 40 stunning panel finish options, and a choice of matt aluminium or lacquered bronze frame finishes – we hope you are inspired to be creative. 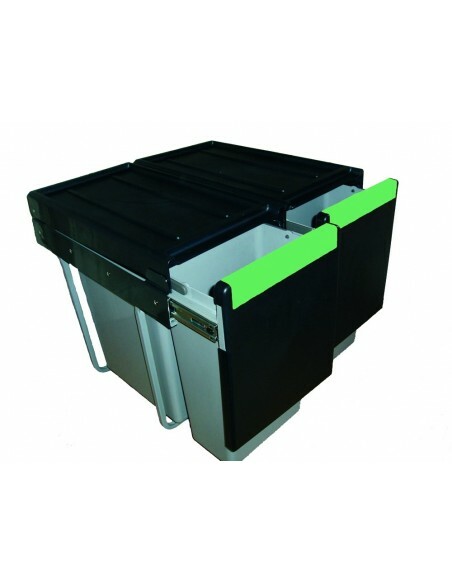 We also offer a large range of internal storage solutions. Shelves, rails & pull out racks add to the space saving & storage ideas. Send us your sizes and we would be happy to plan and price your sliding door needs. All we require is : Height & width of the wardrobe aperture you are working with, Colour & configuration of the door style, Frame choice, Soft closing or standard runners and your delivery address. 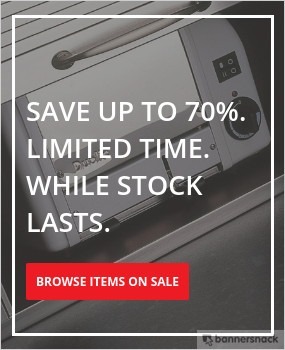 Telephone 01205 760462 Or Email us @ sales@eastcoastkitchens.co.uk for information or to request a brochure. Sliding Robe : Example Price : A Two door run 2305mm Height x 1640mm Width, Including a three panel split in Coco Bolo & Stone Grey with Curva Aluminium Tracks, along with the soft closing action would currently be £749.00 + Vat. Delivery & interior storage would also be available, please email for various prices on these options. Volante Sliding Robes, White Avola & Matt Stone Grey Centre Panel. Curva Matt Aluminium Frame. Part of the made to measure range - any size available. 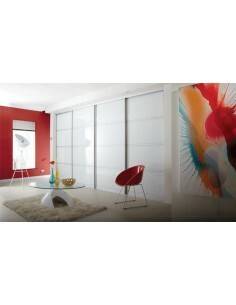 Volante Sliding Robe Doors, Pure White Glass Panels, Curva Matt Aluminium Frame. Made to measure - any size available. Volante Sliding Door Robes, Coco Bolo & Matt Stone Grey Centre Panel, Curva Lacquered Frame. Part of the made to measure range - any size available. Two Door Run Example Price In This Design Would Be @ £749.00 + Vat. Volante Sliding Robe Doors, Matt Lava Mussell Four Panel, Curva Matt Aluminium Frames, Part of the made to measure range - any size available. Volante Sliding Door Robes, Ferrara Oak & Dark Red Glass Centre Panel, Curva Aluminium Frame. Part of the made to measure range - any size available. 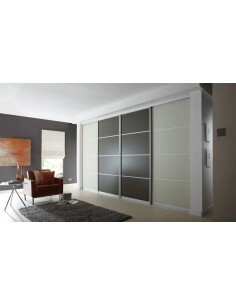 Volante Sliding Door Robes, Light & Dark Grey Suede panels with Curva Aluminium Frames. Part of the made to measure range - any size available. 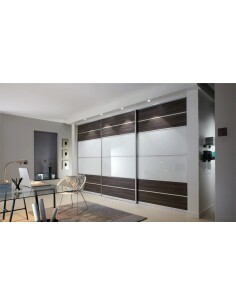 Volante Sliding Robe Doors, Grey Brown Ontario Walnut, Bronze Mirror & Dakar Panels, Curva Lacquered Bronze Frames. Part of the made to measure range - any size available. Volante Sliding Door Robes, Red Brown Highland Oak, With Light Grey & Grey Metal Panels. Curva Matt Aluminium Frames. Part of the made to measure range - any size available. Volante Sliding Robe Doors, Light Lakeland Acacia & Peral White Glass Centre Panels, Curva Lacquered Frames, Part of the made to measure range - any size available. 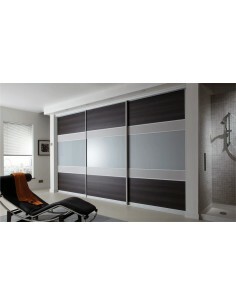 Volante Sliding Robe Doors, Dark Walnut & Black Glass Panels, Curva Matt Aluminium Frames. Part of the made to measure range - any size available.